Hello everyone. Check this one out. It is a photo of a rare Cessna experimental aircraft prototype that could have, if it had been produced, become a replacement for the Cessna C-150/152 line of aircraft. It was called the C-1014 “XMC” which stood for Experimental Magic Carpet. To investigate and evaluate new light aircraft design and aerodynamics, new construction techniques and advanced materials, Cessna build the XMC (Experimental Magic Carpet). This sole research aircraft (N7174C, c/n 674) was given the engineering designation Model 1014. It flew for the first time on 22 January 1971 with Bruce Barrett at the controls. Subsequently the XMC entered Phase I of the research and development flight testing programme, consisting of ground handling, flying characteristics and visibility throughout the entire flight regime. The two-seat XMC had a swept-back high-wing placed aft of the cabin giving the pilot greater turn visibility than possible with most high-wing designs. Further it featured a twin-boom twin-fin tail construction and spatted nose gear. Power came from an 100 hp Continental O-200A reciprocating engine mounted behind the cabin and driving a pusher propeller. 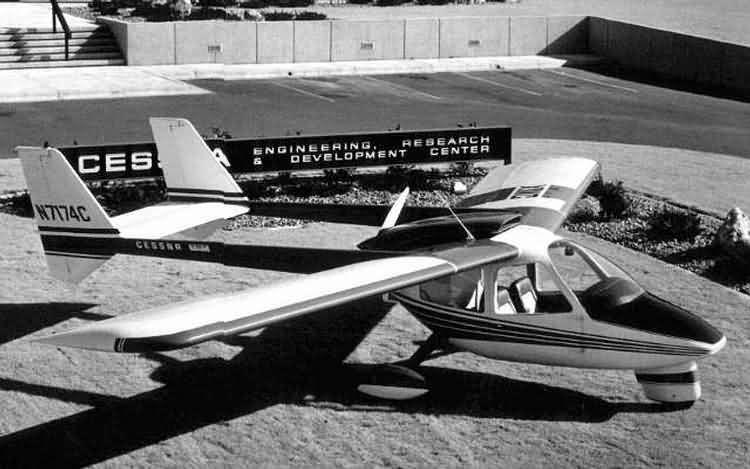 Phase II of testing started in May 1971 and methods to reduce weight and costs of both single and multi-engined Cessna models were tested. In 1972 the XMC was modified for Phase III to such an extend that it received a new engineering designation, Model 1034. First flight of this new model, still named the XMC, was made on 1 June 1972, again with Bruce Barrett at the controls. Modification included the spatted nose gear being replaced by a wheel fairing, vertical stabilizer area was increased, and wing tips were revised. Most important alteration was the shroud being placed around the propeller to explore two design areas: improvement of the propulsive efficiency; and noise reduction. Other tests with the XMC were experiments with CG (center of gravity) effects, control surface location/response, cabin noise levels and relationship of wing to engine/propeller. The noise reduction did not work, in fact noise level rose two or three decibels due to the higher engine revolutions. In the end the project was dropped because it also provided no significant performance increase over the C-150 model already in production and Cessna had engine-cooling problems with the XMC. Wonder what might have happened had they decided to produce it. Would it have become as popular and as common as the 150/152? Would a lot of them be flying today? Questions that can never be answered.